A bit of a solemn day, I admit, but the news must be reported. My time in Wow is at an end. Though the game is still fun, I just have no motivation to play it anymore. This was, after all, a long time coming given that I stopped raiding after our Heroic Lich King kill. I'll miss you all. If you want to keep in touch, Zaephod#1435 is my gamer tag. Before I go, I want to share with y'all some of my favorite and most lolworthy memories from my wow days. Noob moment #1: I came to this game from Planetside and from Diablo 2. In Planetside, the only way to level was to kill stuff. So, on my first character, aside from running the occasional instance, all I did was grind mobs to level...in vanilla...mostly outside Zul'farak. As you can imagine, I didn't level very fast. Noob moment #2: When we were playing the trial, we tried to trade stuff by using the Diablo method of dragging it from your bags out into the world. We couldn't understand why we could never find what we were dropping for each other. Noob tanking moment: So, when BC came around, Honorbound convinced me to be a Tankadin with my otherwise terribly geared paladin. Not that I was tank-geared or anything. First night of the expansion's release, we're running Ramparts in Hellfire Peninsula and I'm tanking my first instance. We came upon a particularly nasty set of trash that was tearing me a new one. Just before I was about to die, like the smart pally I was, I bubbled, killing the rest of the group before the bubble wore off. Fun tanking memory #1: My first raid with Moonshade and we were progressing on Morogrim Tidewalker in SSC. They needed a tankadin and there I was, ready to help. Without knowing virtually anything about the fight (regrettably), my assignment was to pick up the murlocs when he called for them. Literally, with righteous fury up, I was drop as many holy lights as possible when they spawned to get good AOE threat on them all before they got to us. We got the kill that night, and I was happy about that. 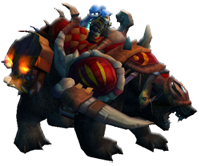 Fun tanking memory #3: After 3.0 dropped, but before wrath hit, we were still progressing through Sunwell. I was ret for Brutallus and ret was so broken that on that fight I was #3 in damage and #1 in healing. But 3 fights later, we were on M'uru and I was tanking again. We got to Entropius and were doing ok, but people started dropping like flies with ~20% to go. With ~2% left, it was down to me. Dots were up, vent was going crazy, and I had 2 cooldowns available to me. I bubbled when I got low and healed up what I could. Bubble faded, cheers were loud, and my finger was on the Lay On Hands button. Before even needing it though, he fell and vent erupted. 'Twas a good night. Fun tanking memory #4: The Ulduar hard-mode group was some of my favorite effort from my time tanking. The first Algalon kill sticks out in that we were all dead at the time, and Skyfall ankhed right as the boss died. We got the Achievement, but the loot chest didn't appear. Thanks to a GM ticket, everything was sorted out. The next week, he was nothing. Final tanking memory: The Heroic Lich King kill was imminent. Then 4.0 dropped and we were set back a few weeks due to the new class mechanics we had to deal with and whatnot. Finally, we caught back up to where we were but in our new specs. On the kill attempt, we made it through to the last phase with no one dead but all the battle rezes used. Then, thanks to a nicely timed Soul Reaper and needing to run across the platform to escape the exploding ghouls, I bit it. From there, I went into coach mode. Honor solo tanked the final roughly 27% of it, I was calling timers and making sure not mention how close the kill was getting. The group did fantastic and the cheering was great when the 10% event happened. I was so glad to see that guy dead too, he deserved it, and we were all the Bane of the Fallen King. So proud. Lastly, the spinning annoying Ragnaros kill news article. I worked really hard on figuring out how to make all that stuff happen, then I put in an Easter Egg to turn it off just so I could bear looking at the page. Since it's been long enough, click on the word "Fix" in the article to, as the function's called, stop the madness. depressing guild message of the day! Although I didn't join mshade until ICC hit, you were my favorite tank to raid with and we had lots of fun times taking down arthas! Gonna miss having ya around in guild, and best of luck! I'll add ya to my battle tag. Not sure if it adds you too? I was totally there for each of those tanking moments, minus Muru. Tidewalker I healed the people getting watery graved. I loved it, since that was the only fight in the entire game I could actually get people to click Lightwell. They couldn't make it back into DPS range without having to literally run through it. Marict and Oarik liked having another Paladin since it meant they didn't have to get eaten by the Murlocs. That first Algalon kill Piratecat and I had already released. Wiping at 2% was painful, but Algalon was on a timer so we had to gogogo between pulls. We both /boggled when the achieves popped. Nothing like a GM ticket to celebrate a guild first kill, a fine Moonshade tradition dating back to Nefarian in BWL. Heroic LK was insane. Closing in on the 10% mark I was the last healer still up. Solo healing the only tank on Heroic Arthas was the most amazing/terrifying thing I can remember doing in the entire game. Gogo new abilities giving Honor and I enough cooldowns between the two of us to make it to the end. Sorry to hear you go, but I can hardly talk having not played in over a year. Or has it been two by this point? My Battletag is (5 minutes Googling through all the joint account crap Blizz has done recently) Logia#1143. Hope to see you guys around. Below space for rent. Reasonable rates.